so close, but not there. The metropolis is my heart. by side, liven then enervate this mindscape. saffron pixelating ire and green that lulls me to sleep each night. And moments, oh the moments. when I finally lay--my home will lay with me. Poet’s Notes: I wrote this poem in response to a prompt on “Cities.” The idea of placing myself, or the accouterments of my life, into one geographic location, was suddenly anathema! I didn't know that I would chafe at the idea of calling “a particular city” my home, right until the time I received the prompt. Home is home and it can just as easily exist at the top of a skyscraper, deep in a jungle, in a shanty held by spit and willpower, or even in the wildnesses of deep space that I don't fully comprehend. Home is an experience, not a place. It is the beating, pulsing heart at the core of every life experience. I carry it with me, whether in a saree or in oil-stained dungaree pockets. I am always home. Editor’s Note: I find the comparison of the city to the features of the wild country to be breathtaking. What a beautiful paean to the city! Had longer lines been used throughout, I might have thought I was reading some of the best of Walt Whitman. I don't think there is anything better to say than that. 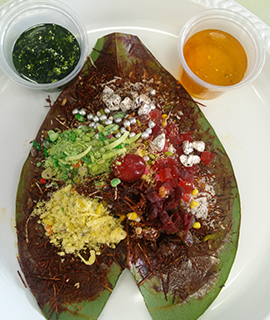 *Paan is an Indian digestive. It is a bite-sized package of betel leaves with tobacco (optional), catechu or black cutch, lime, sugar, coconut shavings, fennel seeds, rose petals et al, inside. It produces rust coloured saliva that Indians spit copiously on walls and all over most cityscapes. The paan is delicious, the spit, not so much.